How to put on eyeliner with poor vision? How do I put on eyeliner with poor vision? Hi, I was hoping you could help me how to do eyeliner for my situation. 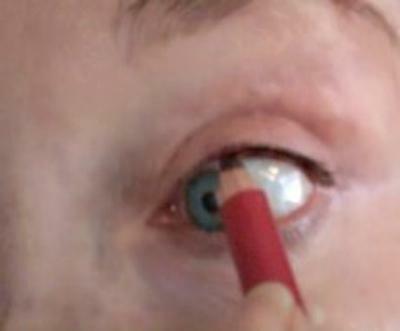 I am 54 and have cataracts and glaucoma, so I cannot see well enough to put eyeliner on my lower eyelid. I know there are a lot of different eyeliner styles and I have seen some women apply eyeshadow instead of eyeliner on the lower lid. But every time I try I just cannot get it to look right. I was hoping you could tell me how to do this. How do I apply eyeshadow instead of eyeliner on my lower eyelids? Thanks so much for your excellent question regarding how to apply eyeliner vs. eyeshadow. Yes, there are tons of different eyeliner styles and yes I have seen women use just dark eyeshadow as a liner for the lower eyelid. But - like you - I have a hard time getting this work right for me. For some reason it does not look good on me. The only eye shadow I can use as a liner for the upper and lower lids is the golden/champagne color eyeliner that I purchased from Mommy Makeup. You can see a picture of my wearing this here at the link below. When you click on the link scroll all the way down to see my picture. This is a nice look and perfect for those who have a crinkles and wrinkles around the eyes because the eyeshadow color is rich but not too dark. Most women over 40 or so find that using too much dark colors around the eyes can sometimes make dark circles and wrinkles look more pronounced. - Only line the upper inside of my eyelid with a dark brown or black eyeliner pencil. - Then blink a few times. This transfer a tiny hint of the dark eyeliner onto my lower eyelid giving my eyes a light outlined look that is soft and natural looking. If you click on the link above and scroll half the way down, you'll see a picture of my showing how I apply the eyeliner to the upper lid. Applying the eyeliner this way, you don't need to have perfect vision, just pull your upper eyelid up and run the eyeliner pencil along the whole inside upper lid. Comments for How to put on eyeliner with poor vision? Those are just awesome tips. Thanks for the same. Hi Linda, thank you so much for getting back to me. These tips you have given to me are perfect. Yes, I tried it before I wrote to you. I am such a misfit when it comes to putting liner on my eyes, so these are perfect tips. Thank you again for all your help. Take care. So glad to hear that it worked! And depending on the brand of pencil you use - you will get more or less color transfer to the lower lid. I have found that some eyeliner pencils are very soft, smooth and heavily pigmented and melt quickly on warm skin so they transfer a lot more color to my lower lids - sometimes too much for my taste. And too much dark color on the lower lids can call attention to crepey under eye skin" or dark circles/shadows. And some eyeliner pencil brands (like Maybelline) are very waxy and require a more heavy hand to apply. But once applied they don't transfer a lot of color to the lower lid. It just takes some time and experimenting to find the look you like and the best pencil for your needs. P.S. Also consider adding a tiny swipe of an eyelifting serum to help reduce the look of lines and crepey skin.